Margaret Gieszinger, a teacher at University Preparatory High School, was arrested Wednesday on charges of child endangerment. Gieszinger, 52, was arrested after a video surfaced of her cutting a student’s hair without their consent during a chemistry class at the high school. In the video, she appears to lunge at another student to cut their hair before the students run out of the classroom. “Early in the investigation, Margaret Gieszinger, an instructor at UPHS, was arrested at her home on December 5th without incident and was booked at the Tulare County Sheriff’s Adult Pre-Trial Facility on one count of child endangerment with bail set at $100,000,” stated a press release from College of the Sequoias, where the high school conducts its classes. Mizner also said that after UPHS administrators sent Gieszinger home, he began the initial investigation of the scene which included numerous interviews and the collection of video evidence. The investigation is complete and the results will be submitted to the District Attorney. According to the California Commission on Teacher Credentialing, Gieszinger’s credential had been suspended for six days in December 2007 and for 12 days in May 2016 under California Education Code 44421. One of the complaints Lacy had was about her hair and Gieszinger’s interest in it. “She touched my hair at the Veteran’s Day assembly and that was the third time she had talked about it,” said Lacy. On Monday, she lashed out at students over tests that were supposedly stolen, said Justin Riggins. “She said that we were responsible for the tests she lost even though we turned them in the week before… She seemed very agitated and angry during the whole class,” said Riggins. Though students were shaken, they did not express animosity toward the school. “The school did everything they could the best they could,” said Emily Kendrick, who was in the class when Gieszinger cut the student’s hair. “I’m not angry at the school. I’m angry at the people who hired her,” said Lilli Gates, a witness to the event. Eyewitnesses reported seeing Lead Teacher Helen Milliorn-Feller and Principal Eric Thiessen enter the classroom while the students were directed towards the conference room at the back of the office. In an email on Wednesday, Principal Thiessen assured that action was taken to guarantee the safety of the students. “Please be assured that the teacher is no longer on campus nor will be returning. 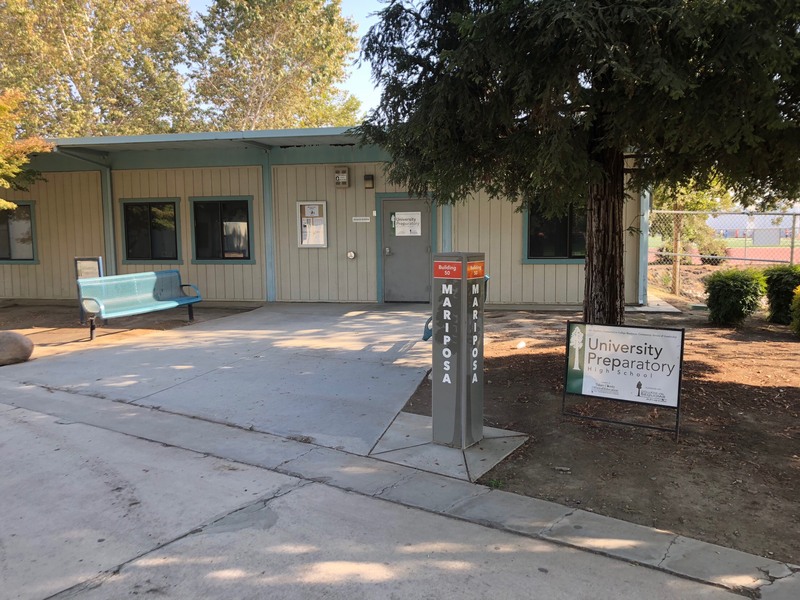 I am currently working with the Tulare County office of Education Human Resources Director and the Assistant Superintendent of Instruction regarding the matter,” said Thiessen. UPHS is also offering counseling for all students free of charge. Classes are expected to run on schedule until the end of the semester. As time goes by this teacher’s mental health history is more and more coming to light showing that her teaching credentials should have been permanently rescinded some years ago for everyone’s benefit; students and the teacher herself. There is enough stress to go around being a teacher or student these days…..knowingly hiring someone who has a history of numerous mental breaks to be in charge of a classroom full of active kids or teens is asking for trouble. I hope she gets the appropriate help she needs. If and when she gets past her legal battles and staying with her mental health treatments to assist in her stabilization, I hope she can find a job in another line of work. If the young man is allowed he too will get past this (more than likely once his parents have prevailed in court) and when he is older he no doubt will go on to bring some laughter to a group of friends as he tells the tale of a crazy teacher giving him a really bad haircut during class while loudly serenading him with the National Anthem ala Roseanne Barr. Many of us have memories or has heard of a “certain” teacher who acted weird or kind of crazy or just plain old perverted. I remember the teacher in my high school Government class who never, and I mean never, remembered to zip up his pants…..he would straddle an arm-desk (remember folks this was in the days of yore) while talking to the class thus allowing the crotch area to open up even more fully (I can still remember those funny polka dot skivvies he sometimes wore). Once a student would either laughingly or sarcastically say something along the lines that his “barn door was opened” only then would he “slowly” walk back to his desk and once seated try to look casual as he zipped up his pants. Was he a pervert? YES! Were students uncomfortable or embarrassed to say the least in being around this teacher? YES! Of course all this happened long before accusations of “sexual harassment” was a power to reckon with. There continues to be a few creeps, both male and female, teaching in our schools. School administrators need to do a more thorough job of vetting the teachers that they look to hire. That said, I would surely be remised if I failed to say that the vast majority of teachers are well respected and valued as people of trust who do the hard work of teaching our children each day throughout their school years….. a great big thanks of appreciation to each and every one of them. I am outraged at the county HR Dept for hiring this woman! Those involved need to be held accountable for child endangerment. Remember not long ago when people wanted teachers to be armed in the classroom? What if she was allowed to carry a gun in class? That whacko could have killed someone! Background checks are critical for all jobs especially those involving children. Everyday I read about teachers and coaches being arrested for sexually assaulting students. I’m sick to death of the possibility of a vial individual hurting a child. this is a “nothing story”. Everybody is going a little crazy since Trump & the Russians stoled the election. She could have some: mental problem, maybe a more serious health issue but there was no reason to treat her like a criminal! the real mental issue is– Tulare co treated her like a crook when a guy got arrested for drugs and they released him and he killed 2 people and they try to blame the state. When, the buck stops with the sheriff’s dept. & stupid local courts because they treat druggies, gangs & thieves like there nothing crimes.